From time to time, I get together with one of my colleagues from residency to catch up on what’s going on in the primary care community. We used to be able to make it happen quarterly, although as her practice has gotten busier and as her children have gotten older, it’s more and more difficult to do. We last got together almost a year ago, and then had a flurry of rescheduling and canceling until we finally arrived at the following summer. Of the residents I trained with, she is one of the few still practicing traditional primary care. The rest of us have either hung it up entirely or moved into semi-related careers in urgent care, emergency medicine, sports medicine, aesthetic medicine, telemedicine, or clinical informatics. We were finally able to catch up this week and dish a bit about the healthcare landscape in our fair city. We both initially worked for Big Health System, both in start-up practices in relatively underserved areas where the economics proved to be unsustainable. I felt a little guilty because she was a year behind me in training and I had recruited her to work in a practice situation that was similar to my own, and because neither of us could ever “make it” given the economic model used by the health system. Typically, a newly employed physician is on a salary guarantee and is expected to break even in the first few years of practice. At the time, hiring hospitals were offering modified “eat what you kill” salary arrangements, which if you did the math academically using average reimbursement for the area, seemed very doable. Despite being more savvy than some of our peers, both of us wound up in the same trap as far as payer mix. As straight fee-for-service providers, we were negatively impacted when both local auto plants closed and many of our patients lost their jobs along with their well-paying insurance. I had already been forced to limit the number of Medicaid patients I saw after coming to the conclusion that having 30 percent of my panel leading to reimbursements of $24 per visit wasn’t going to be economically sustainable. I did make exceptions for patients who were already established, but wasn’t taking new Medicaid patients, which created a crisis of conscience for me as I was caught between economic realities (getting off that guarantee so I could start paying back my student loans) and caring for people as I thought I had been called to do. My employer was ill-equipped to deal with self-pay patients, barely offering a discount and making it difficult to care for people who didn’t have solid commercial insurance or Medicare. Although my visit numbers and my billings were great, my collections were terrible, and I was faced with a steep drop in salary at the end of my guarantee period. Digging into the finances revealed the fact that my employer was charging the costs of building my office against my practice’s cost center, which although not specifically mentioned in the contract, was apparently allowable. Had I taken the easier route and joined an existing practice with no build-out required, I wouldn’t have had any construction costs attributed to me and the cliff I was about to fall from would not have been quite as high. Fortunately, my colleague had gone into an existing space while her office was under construction, so she wasn’t getting hit with the build-out costs and had time to maneuver before her guarantee ran out. Meanwhile, we were watching our friends who had gone out into affluent communities beat the guarantee in barely over a year since they had a stronger payer mix and fewer patients with public aid and bad debt. I was offered the opportunity to transition to clinical informatics, working a bit of urgent care on the side. She didn’t have that option, so she terminated her contract and decided to take her chances with the non-compete clause and work urgent care while she looked for a full-time position. She was quickly snapped up by a rival health system, who offered her a position outside her non-compete radius and with a better compensation plan. Her new employer had realized that they weren’t going to be able to recruit physicians into relatively underserved areas (her new position was rural) without finding a way to make the finances work. This organization used more of a RVU-based compensation model, where physicians were paid more equitably based on the work they did rather than by their payer mix. They also had more of their salaries attributable to quality scores. Looking back, they were much more on the forefront of pay for performance than we had been at Big Health System. Fast forward more than a decade. She is still in the same practice, but coping with the ups and downs that many physicians do. First, there was the EHR conversion to Epic, which created a lot of upheaval and several years of slow progress while the system tried to synchronize content and features across a multi-state environment. Then, there was the birth of Meaningful Use and its respective pains and the rise of Patient-Centered Medical Home and other incentive programs, all of which put stresses on providers. She and her partners are trying to have a semblance of work-life balance when they’re being asked to better engage patients by providing expanded evening and weekend hours, by delivering after-hours telemedicine services for their regional physician group, and ensuring their quality numbers are at the top of the scale. At her age, she should be a good two decades from retirement, but she’s seriously contemplating a change now. In addition to the challenges already mentioned, she cites her biggest struggles as low health literacy and socioeconomic issues – but the challenges are at two different ends of the spectrum. At one end, there is the stereotypical situation where patients lack education about health-related issues and lack the means to address some basic needs. She has patients in her semi-rural community who struggle with food insecurity, transportation issues, lacking support systems, and more. At the other end are relatively affluent patients who have been streaming into the community to take advantage of inexpensive housing and who have much more economic means. However, they have similar levels of low health literacy, but due to insurance coverage and the perceived need for services, rank as “high utilizers of healthcare” similar to their lower-status peers. She finds the latter group more frustrating, as they seek care for many conditions that could be treated at home and with over-the-counter remedies. They tend to use urgent care and retail clinics for convenience, demand care within hours of having any kind of symptom, and often want tests performed when a history and physical would reveal the answers. She’s tried to get many of them to use the after-hours nurse line rather than urgent care or the emergency department, but hasn’t been successful, leading to increased work handling coordination and transition of care issues the next time these patients present to the office. We talked a little bit about moral distress. With one group, she feels she is delivering poor care because they lack resources. With the other group, she perceives the care as poor quality because it’s fragmented and sometimes the patients frankly receive too much care. It seems that dealing with these polar opposite situations adds stress of its own, with too few solutions in sight. For a while, she entertained the idea of direct primary care or a retainer practice, where she could define the terms of care as part of the agreement, but was not willing to give up serving her less-economically advantaged patients. She’s been having thoughts about trying to start some kind of educational foundation or organization that would specifically target health literacy and appropriate care issues, but it’s hard to find seed money for something like that, especially when one of your constituencies is well off. We talked a bit about the idea that “too much care” is relative, that as we empower patients, it’s up to the patients to decide whether they’re receiving too much (or not enough) care and to decide when, where, and how they want to engage with caregivers. It’s a tough spot to be in, especially when you’re trying to manage a business, raise a family, and control your own stress level. I didn’t have any good advice for her other than to validate her feelings and talk about different approaches I’ve seen in my travels. It’s a shame that a physician with so much to offer feels like she is at a crossroads like this, with few choices when she still has a potentially long practice career ahead of her. The health systems in our community tend to suffer from shiny object syndrome, ranging their attention from telemedicine to school-based clinics to medical home to employer-based clinics to retail clinics and beyond. Neither of them seem to be acting very strategically, which adds to the madness of the system. What we’ve arrived at is a two-tier system without admitting it. There’s the “public” safety net system and the “private” alternative for those who can afford insurance. We pay lip service to quality and value-based care and the providers and other clinicians are caught in the middle somewhere. I’d love to hear from people in progressive healthcare systems or delivery networks how they’re addressing this and whether they can make it work, keeping all of the parties engaged and reasonably satisfied (at least enough to keep them at the table). Have you figured out how to keep primary care physicians from leaving practice before they hit the tender age of 50? 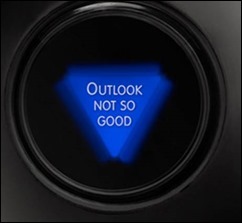 Do you have an answer in your Magic 8-Ball? Leave a comment or email me.